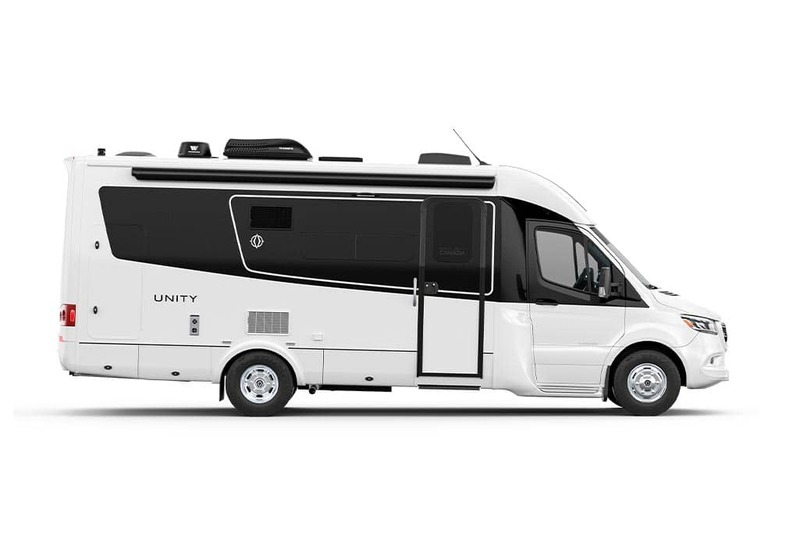 Over time everyone tweaks their motorhome to suit their needs. A year after we purchased our 2010 LTV Serenity we made a point of attending the LTV rally in Winkler, MB, which is something we highly recommend. 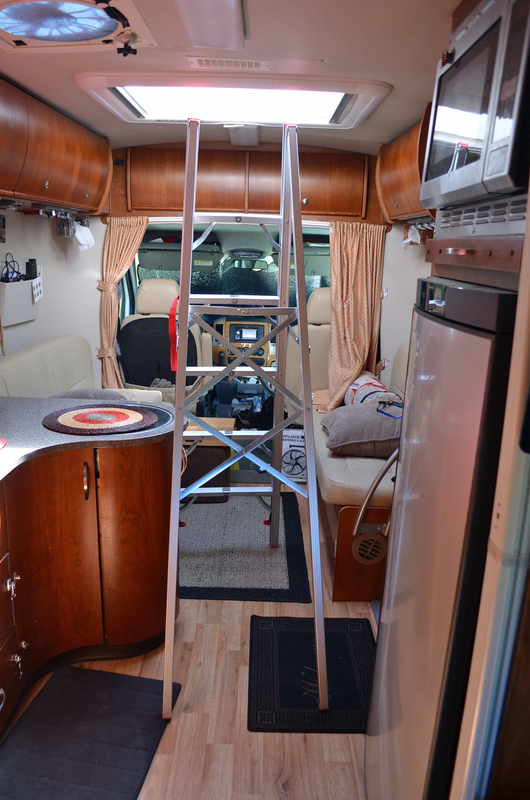 There, everyone is more than happy to show off their motorhome’s improvements. 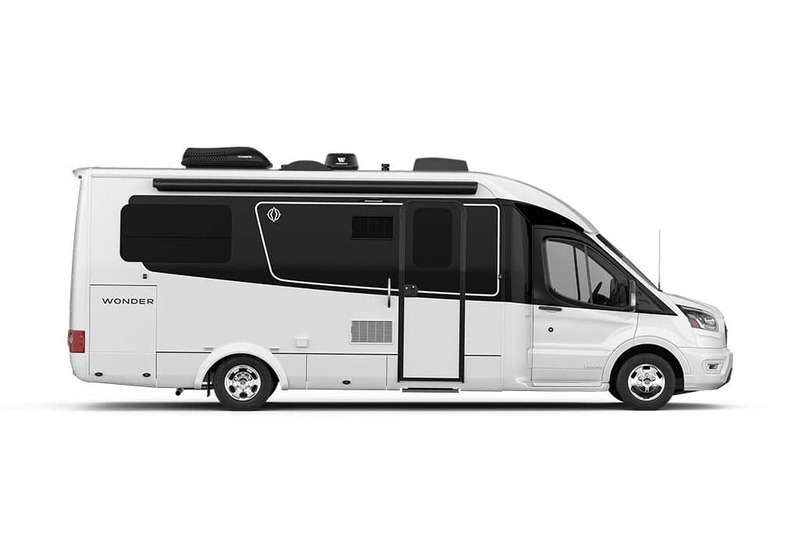 When we entered Gene and Cheri Holcomb’s Libero, we were astonished at how spacious it felt. We couldn’t believe it had the identical floor plan as our Serenity. 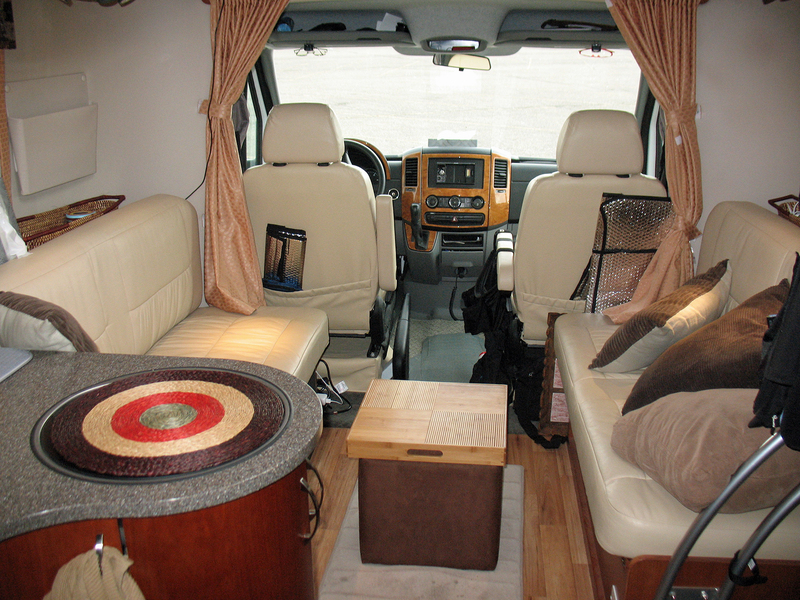 They too had the rear electric sofa bed option, which allows for two living areas. We found that it was a bit difficult to circulate around the dining table to access the cab from the coach or vice-versa. Gene and Cheri solved that problem by moving their dinette table to the back, creating an open, relaxed conversation area in the front. We quickly followed suit. Sometimes we both need a table to do our blogging and video editing. We had two additional table bases installed in the rear of the coach. We stow the table that is not in use in the back of the closet and the legs snap into two holders on the side. A 15” cube, available at Walmart or Target, acts as an extra seat, a footstool, and a storage area for our shoes. 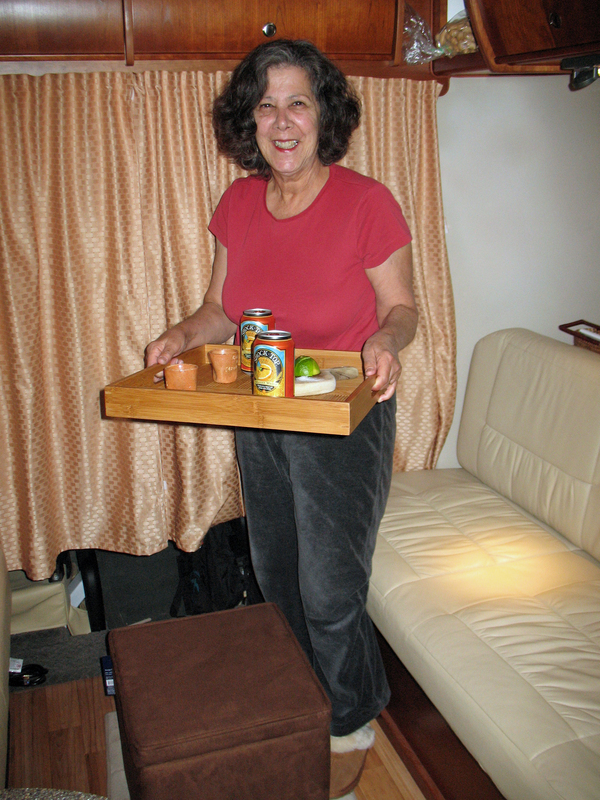 Imagine our excitement when Manny and I found a bamboo tray that fits snugly atop the cube turning it into the perfect little cocktail table when indoors, and a stylish tray to carry food when the party is outside. 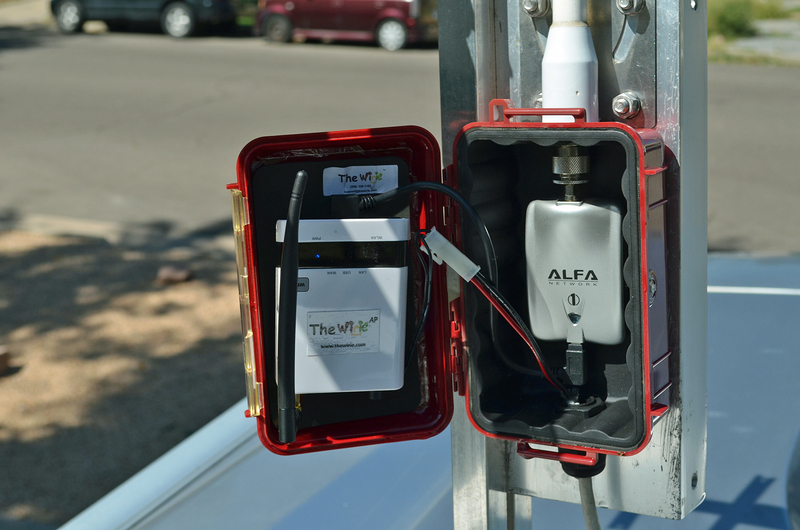 Another item we brought from the maritime world is a Wi-Fi booster called The Wirie. 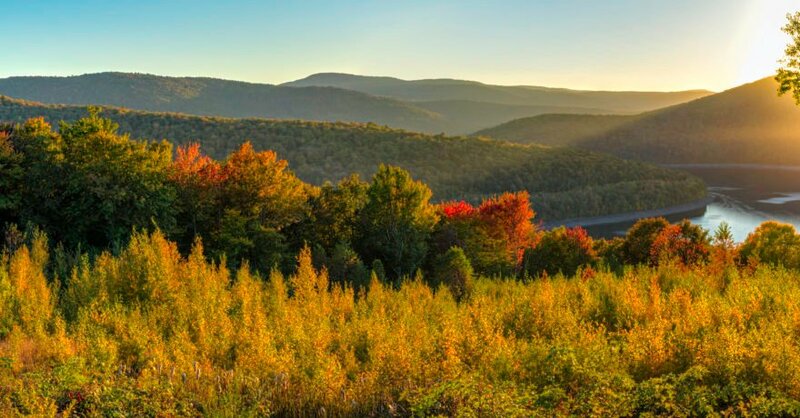 Campsites often claim to have Wi-Fi but the reality is that if your site isn’t right next to the office, most likely you’ll be out of luck. The Wirie takes care of that problem where it reads all the Wi-Fi signals within line of sight and lets you join any open Wi-Fi network. What we really like about the Wirie is that its router lets you set it up as a password-protected network. Another nice feature of the Wirie is that you won’t have to pay a Wi-Fi access fee for each one of your devices at camp grounds. You need only pay for one Wi-Fi access fee for the Wirie and connect all your devices to your Wirie’s Wi-Fi signal. One of the pros of Class Bs is size, but size is also one of its cons. We constantly look for ways to optimize space and keep our home on wheels in ship shape. I used to keep my clothing rolled up and stored in the overhead cabinets. Not only did I have difficulty finding things but every time I opened the door something spilled out. 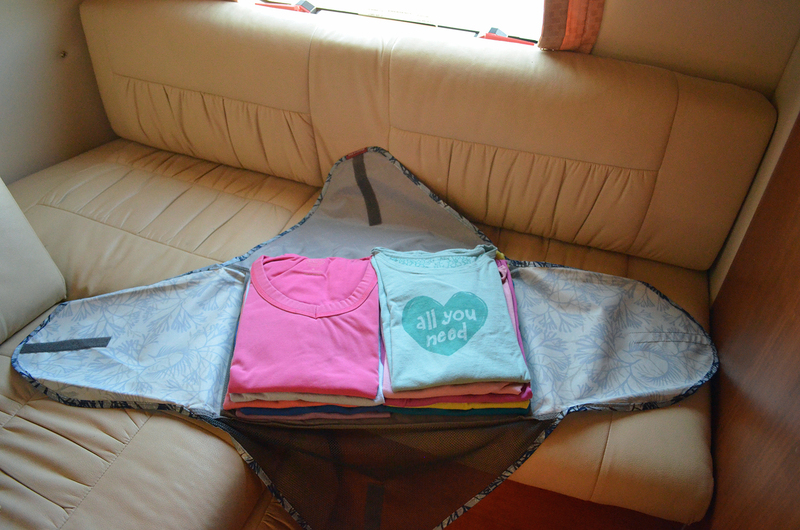 The 18″ packing folders and cubes by Eagle Creek have solved this challenge and now I can fit at least 10 blouses, several sweaters, or 3-4 pair of pants in each packing folder. All socks, underwear, workout clothes, etc., are contained in Eagle Creek packing cubes. 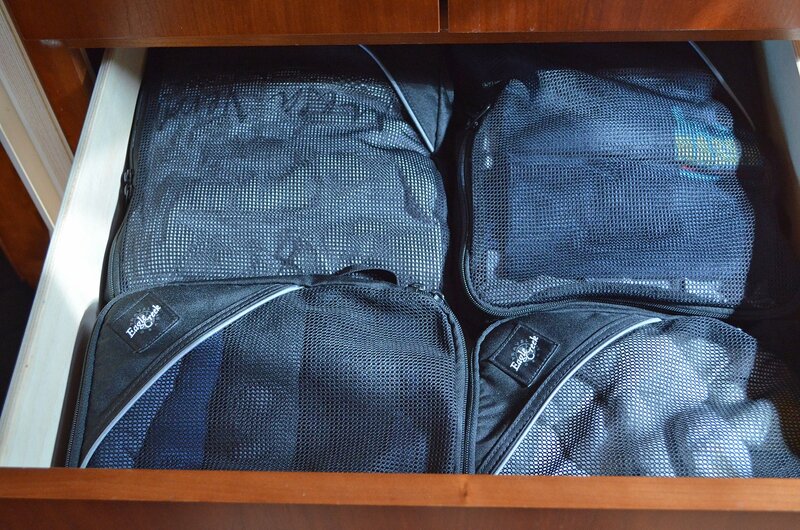 Manny and I each have one overhead cabinet and one drawer where we stow 3 folders and 4 cubes allowing us to to keep all of our clothing neat, accessible and fairly wrinkle free. Speaking of accessibility, Manny noticed that the rear bench —usually a fixed piece of furniture— is actually the trunk’s cover. 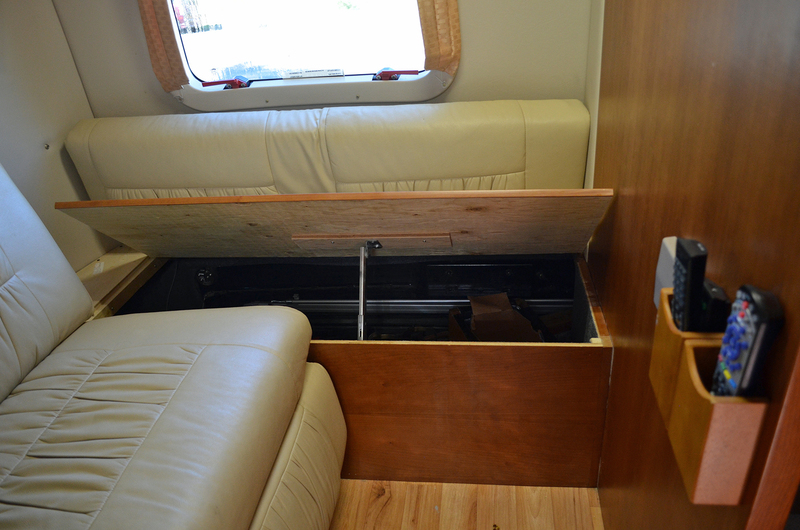 We were able to put a hinge on the lid of the bench to allow us to reach the trunk’s contents from inside the coach. Additionally, probably the most ingenious enhancement we have made is the increased storage capacity Manny achieved by making cupboards behind the back rests on the settees. Under the seats on the settees we are also able to keep a few books, which are easier to read with the swivel LED lights we installed throughout the entire coach. Previously the lights were in a fixed position. They were also all on the same circuit. If you were in the salon or in the sleeping area all the lights had to be either on or off. Now, each swivel light has its own switch and can be turned on or off individually. Are you into boon docking? Two 65-watt solar panels have enabled us to extend our dry camping trips. We also have two inverters, making it possible to use some appliances without the generator—which is helpful where generators are not allowed. I remember one hot summer night in a non-electric site when we were able to employ both our O2Cool fans. Although they can be operated by 6D batteries, the fans are much more efficient when using the AC. Our inverters did the trick and we felt oh so cool! Cleaning the solar panels is a snap using our portable folding ladder. It stows inconspicuously in the stairway and is small enough to set up inside, allowing access to the roof through the skylight. You can watch the video of our folding ladder review here. Once in a while our Fantastic Fan stops working and a trip onto the roof is necessary to clean the contacts, which reinforced our decision to buy the 6 ft. folding ladder. 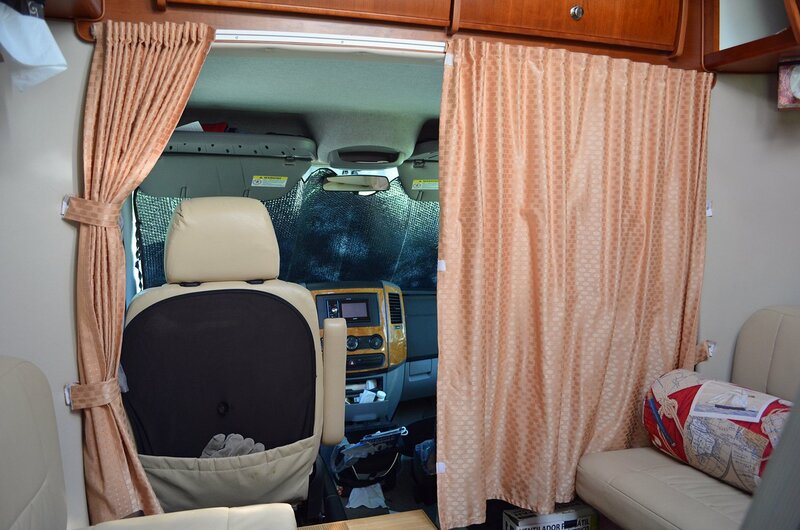 When we stop briefly to use the bathroom or change our clothes rather than pull the large curtains across the windshield we have a small curtain that separates the cab from the coach. We use the curtain all the time when parked as we find it also helps to retain the cool air in summer or the heat in winter inside the coach. I am amazed at the difference in temperature between the cab and the coach when we use this handy partition. 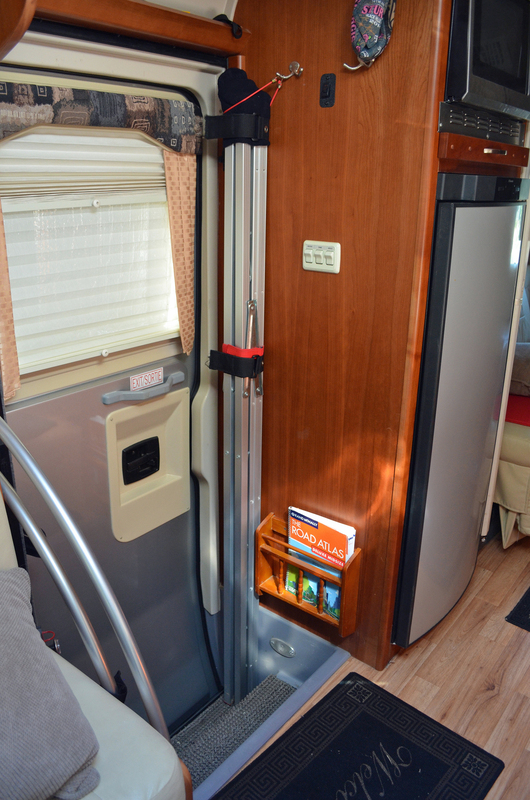 Keeping our motorhome warm or cool is also enhanced by the window insulators I adapted using windshield sunshades. 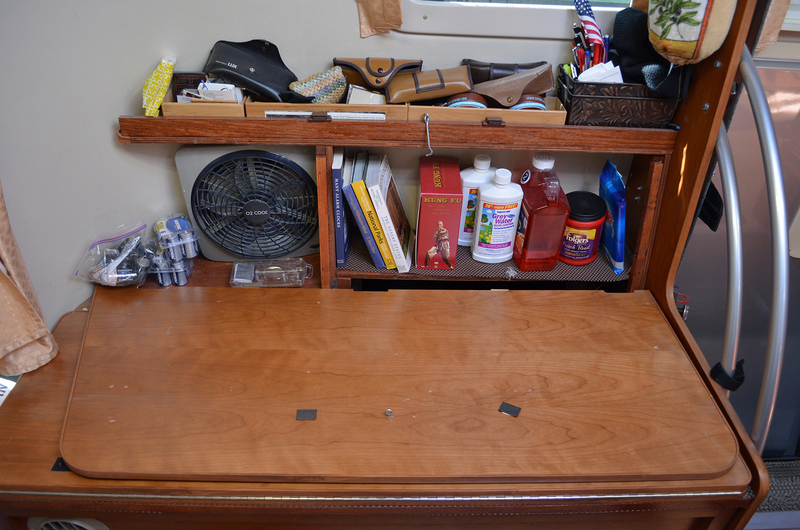 The best way to keep a small space organized is when there is a place for everything and everything is in its place. We have three wall-mounted tissue box holders, a magazine rack in the exact color as our cherry interior, and Command hooks which are attractive, removable and can be attached where screws would be inappropriate. 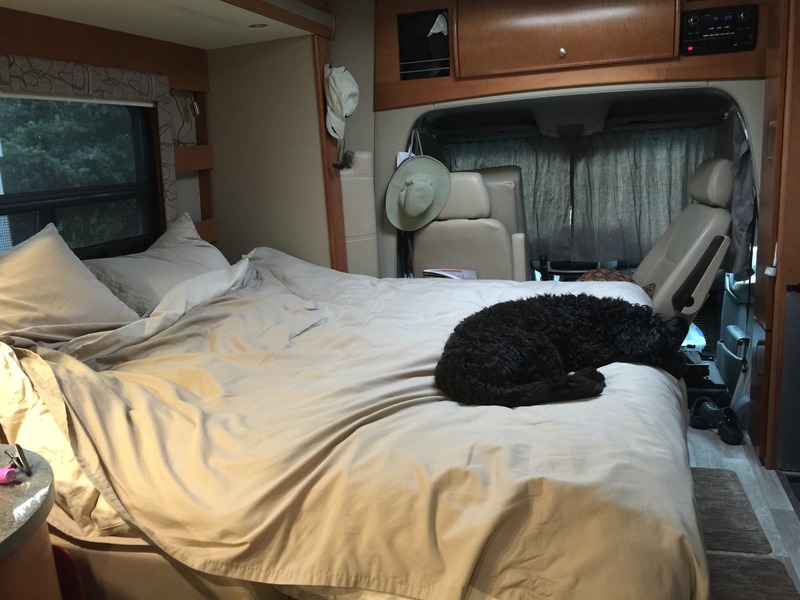 These inexpensive items keep things off the counters and the floor, and have made our life on the road in Serena safer and all the more comfortable. Check out our video and see some of these enhancements in more detail, so you can do them too!